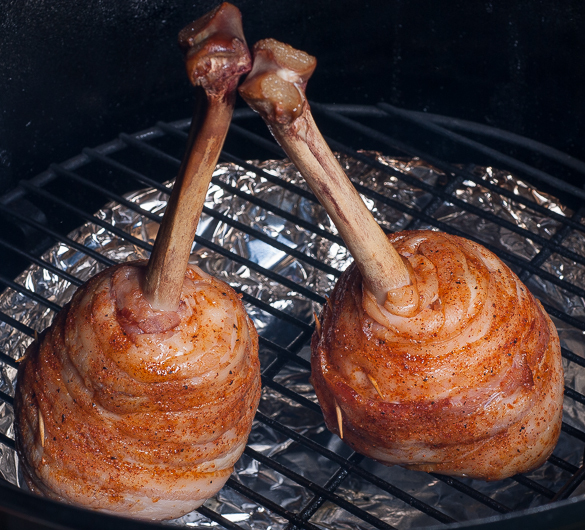 When my Google search for bacon wrapped turkey lollipops yielded no hits, I was puzzled. There were a ton of recipes and directions for chicken lollipops so I wondered why. 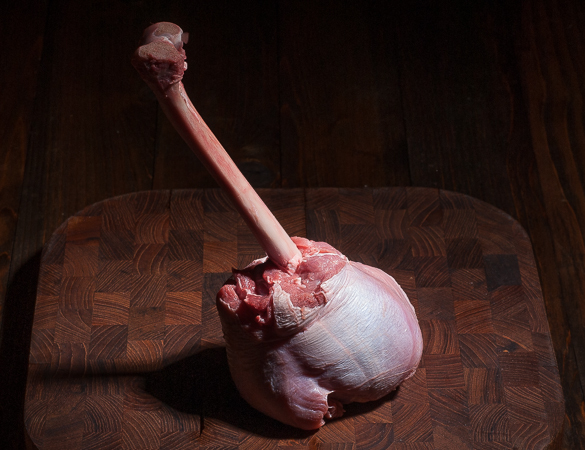 I think I know the reason after attempting to make turkey drumstick lollipops . . . it’s hard work to make them. Were the results worth the effort and time it took? I certainly think so. Consequently, don’t wait for your next Renaissance Faire event or Cosplay party to try them out because they are unique, doable, and most importantly, delicious. The step by step instructions and photos below take you through the process of making them. 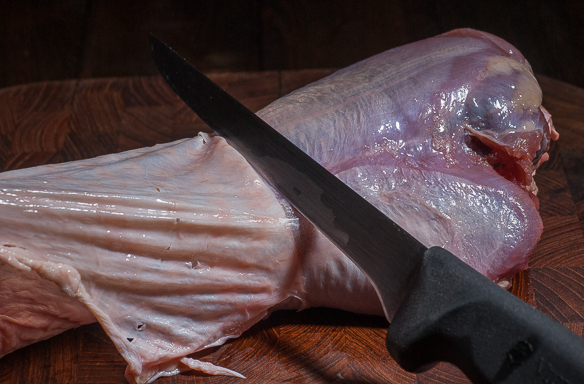 Plan about 10-12 minutes prep time for each leg and always be sure your knife is facing away from you and your hands. 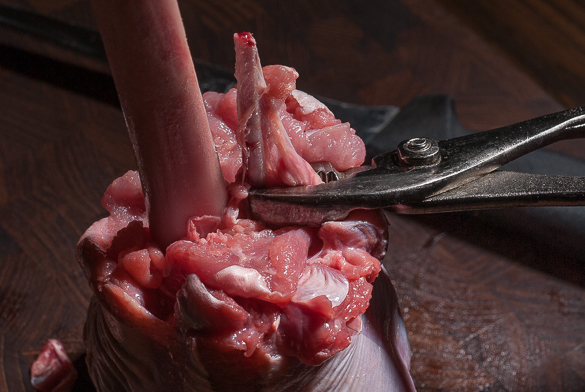 You’ll need a sharp boning knife and some culinary pliers. If you don’t have culinary pliers, a pair of regular pliers is fine provided you thoroughly clean them of any garage gunk first. 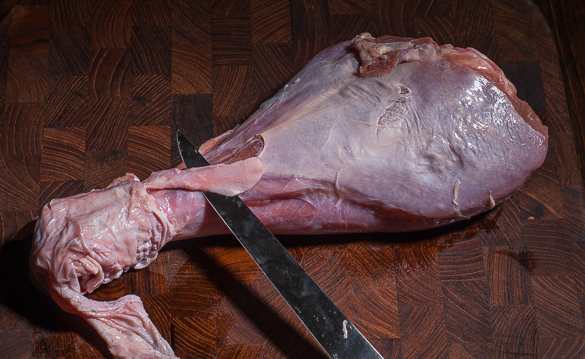 Use some paper towels to help grip the turkey drumstick skin so you can pull it off. 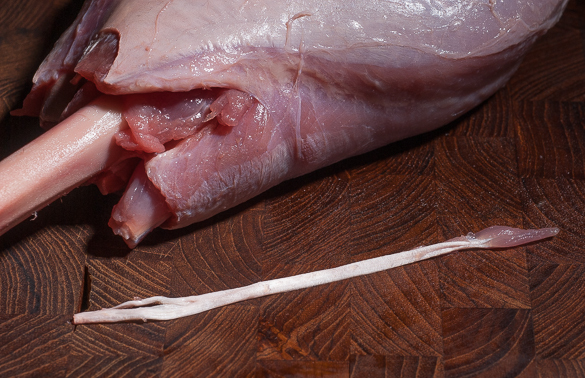 There are about 10 tendons and thin bone sticks that need to be removed so you can sink your teeth into it without biting into tendons or bone. I left the end uncut as it’s too thick to chop off unless you have a huge meat cleaver or hacksaw. 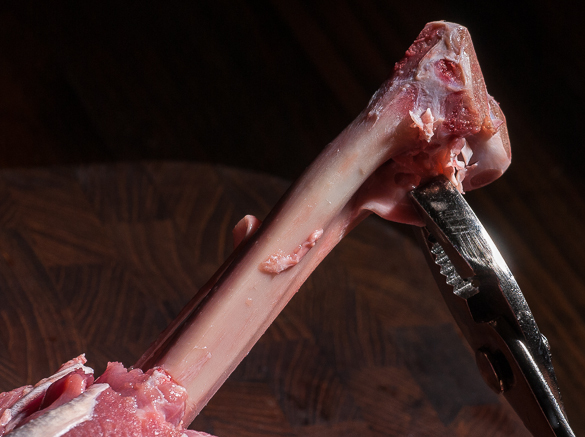 I think the exposed uncut end-bone works well with the medieval theme of the photo shoot. 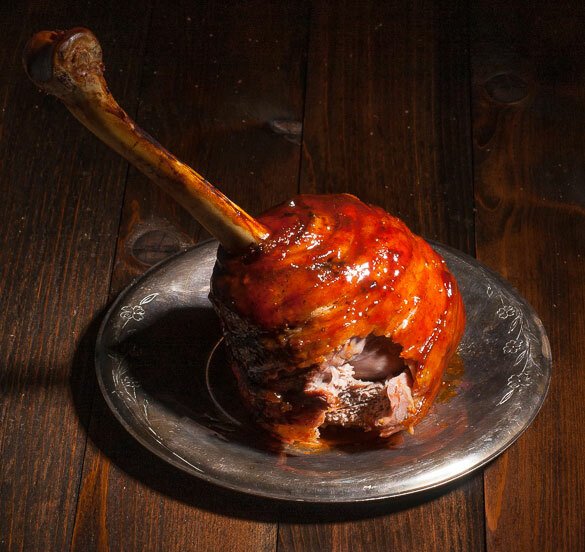 There is something Robin Hood-ish about chomping down on a jumbo turkey leg. 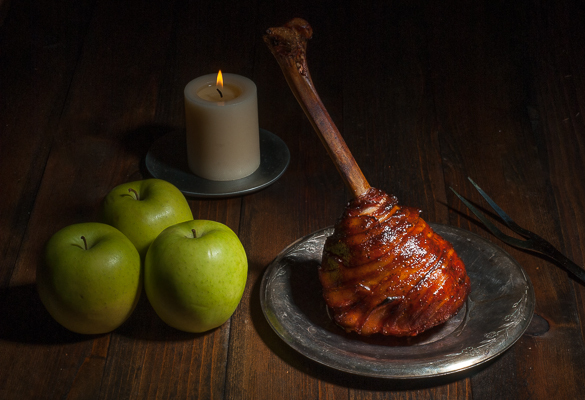 I want you to imagine the Merry Men in the kitchen with a roaring fire roasting their big juicy turkey legs while plotting against the Sheriff of Nottingham. You’ll be amply rewarded as the end result of the turkey meat and bacon combination is amazingly delicious. 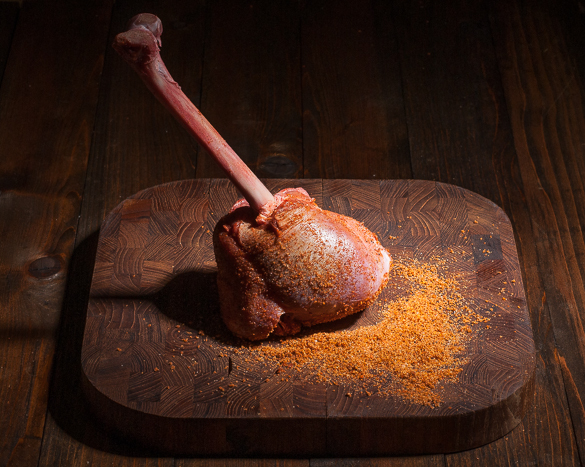 You and your guests will experience a turkey leg like they have never had before. 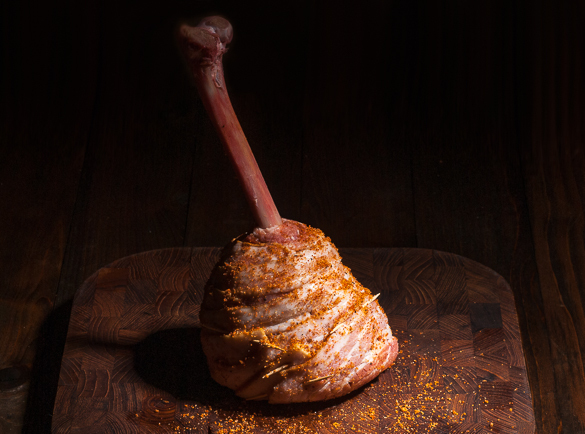 Because you’ve taken the extra steps, their bite will be free of most things that get in the way because you’ve pulled them out to make these bacony, juicy, and moist turkey lollipops. Once you chow them down lickety split, wait for the coma-inducting tryptophan and serotonin in the turkey to kick in. Your eyelids are getting sleepy, very sleepy. Post some comments for me after you awaken from your nap! 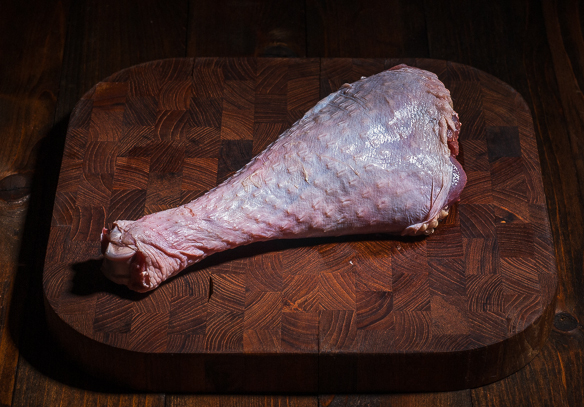 Pull back on the skin of the turkey leg while using a boning knife to gently separate it from the meat. Once you’ve pulled it back to about an inch from the end, don’t bother taking it off yet, just go to the next step. 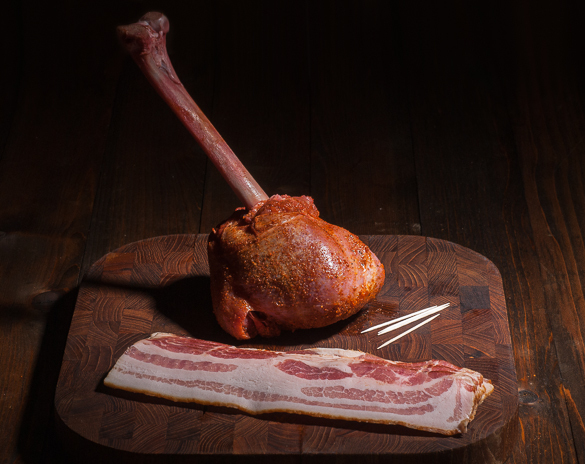 There are 3 bone blades towards the thin end of the drumstick. 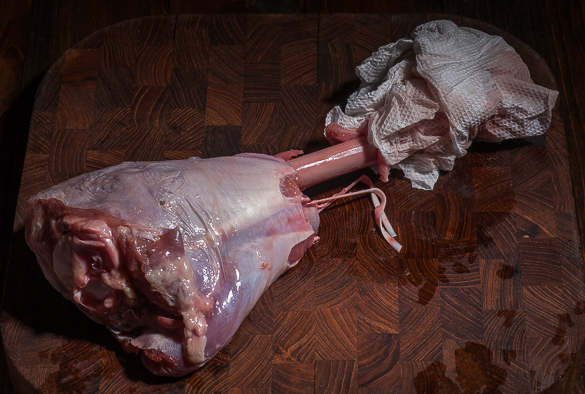 Work the boning knife below them between them and the meat, cutting them loose. 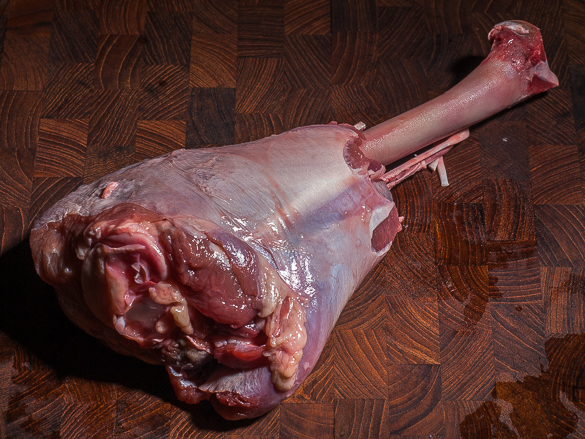 Make a cut around the bone as shown in the photo below, just below the big ball of the meat. Keep cutting around in circles a few time giving it a little pressure (make sure to tilt knife away from hand slightly in case you slip the knife will go away from you instead of towards you). 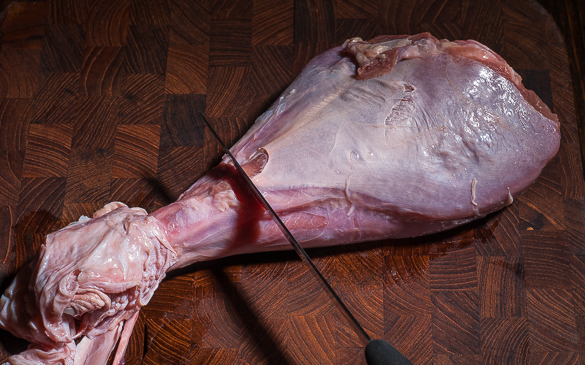 After doing this, work the knife under each tendon & bony sticks, cutting upwards (and away) severing them all.Start scraping the bone (with the knife tilted away from you) towards the thin end pushing down all the fragments of meat, tendons, skin, etc.. as shown in the photo below. Use a wad of about 2 to 3 sheets of paper towels to grab the slippery skin and the rest. Pull it off the end of the turkey bone. It probably won’t fully come off. This is where you start twisting it over and over until it comes off. 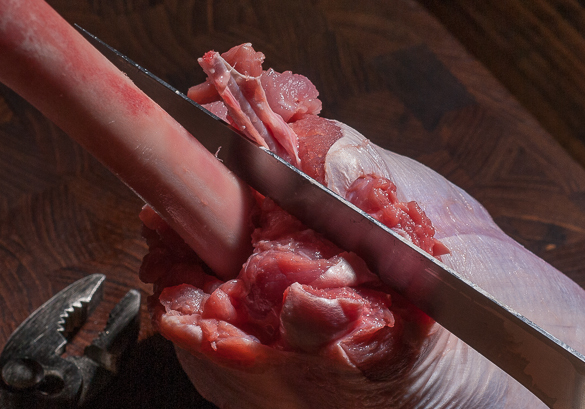 Use the boning knife (cutting away from you always) to work most of the bits off to scrape down to the bone. Then use the pliers to grab any small pieces in crevices. Now that we are done with all that, we need to remove all the tendons and bony sticks from the other end. Do this with the pliers and the knife when needed. 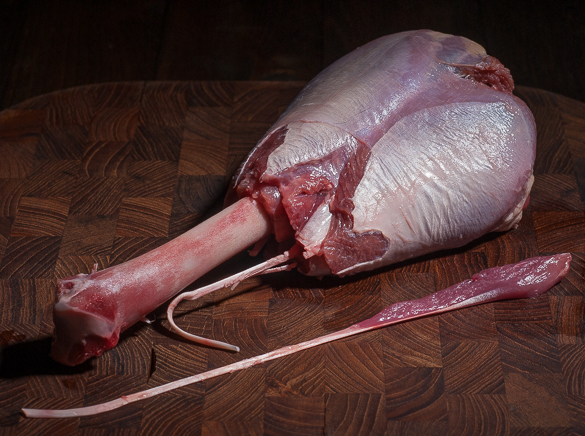 Some tendons/sticks will come right out with no real meat on them. A couple will come out with a tiny amount of disposable meat on them. 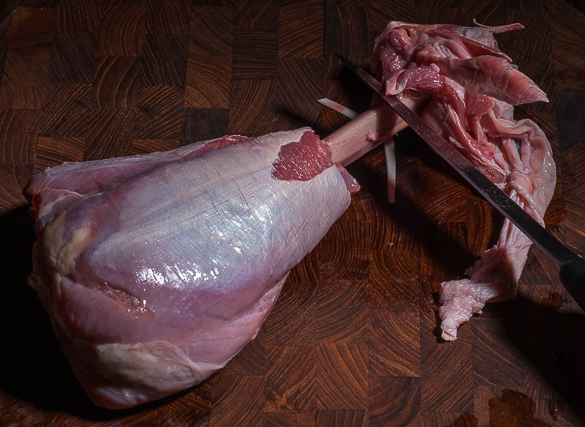 Then there are a couple that will start pulling out large portions of meat when you tug on them with the pliers; this is where you start using your boning knife to scrape the meat away from the tendon you are pulling on—eventually it will separate with the tendon coming out and the meat remaining on the drumstick. Then there is a huge thick bony stick that sits right down tight next to the main bone. 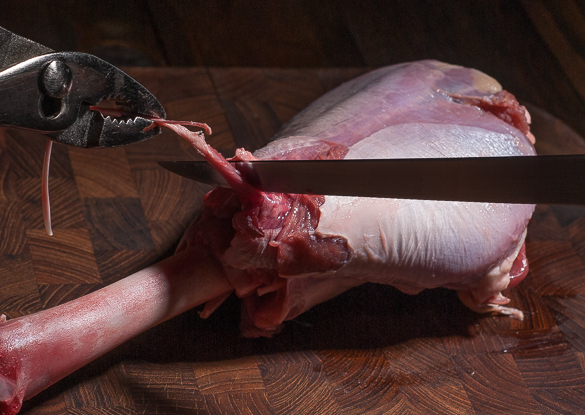 Work the boning knife between the two slicing down as far as you can go without cutting into the ball of the meat. 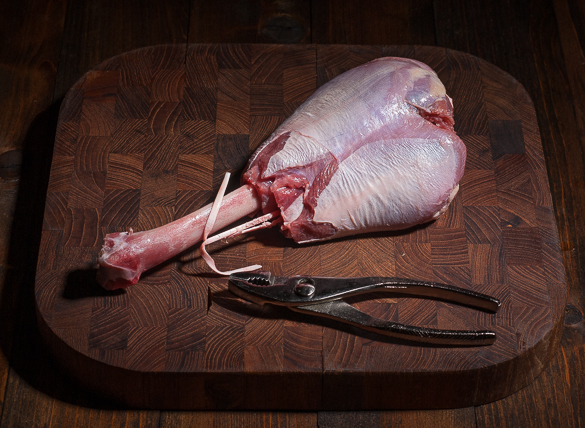 Once that is free then use the pliers and go down into the ball of meat as far as you reasonably can and break that large bony stick down there that you just separated from the main bone. Scrape the bone downwards off the bone towards the ball and remove the fragments. Push the meat down into a ball. The result should look like the following. Season with SYD chicken rub. Wrap in bacon and toothpick where needed. Season again with SYD chicken rub. Barbecue in your Weber Smokey Mountain (I used an 18-inch one) at 350F until an internal temp of 165F. About an hour to 1:20 depending on size of lollipops. I’m sitting here trying to figure out what I like better… the recipe or the photos! Amazing job on both fronts here!!! I think you’ll have to try the recipe to tell which you like better. I’ve heard this is absolutely delicious. Thanks. The Robin Hood feel was what inspired this unique recipe. Check out more crazy bacon-ventions on my site! 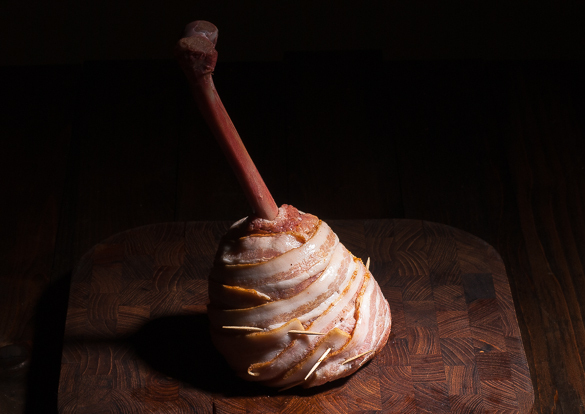 I’m embarrassed to say that the words "bacon-wrapped turkey lollipop" immediately jumped out at me on Foodgawker. Awesome idea! LOL! You’re welcome! More bacon-ventions coming soon. Did you see the bacon pineapple mozzarella rings? You’re right Bill. Sorry for the confusion. 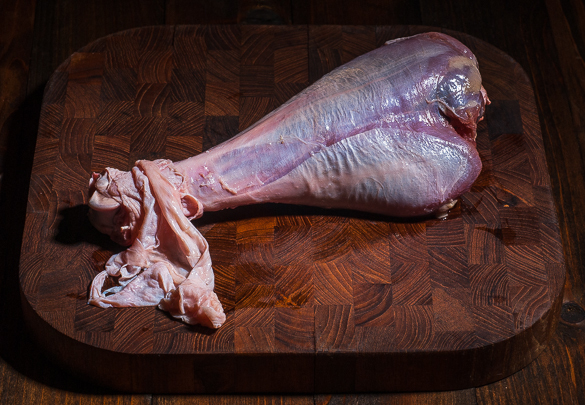 Despite their popularity among the crowds at medieval fairs, turkey legs would not have been found anywhere in Europe during the middle ages. The turkey is actually a New World bird, the only two living species of which reside in North America and Central Mexico. 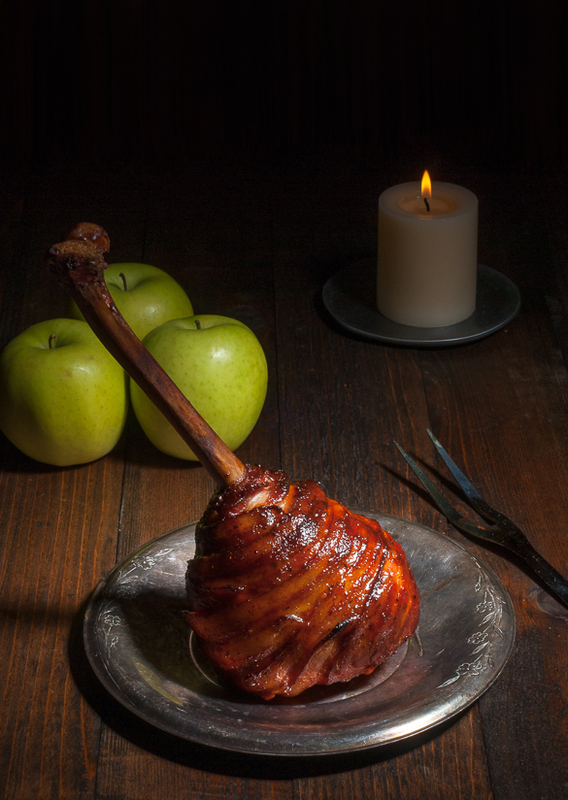 The turkey legs at medieval fairs can be mostly attributed to four things: they are economical, they are easy to carry around the fair, they are tasty, and everyone has seen at least one painting of Henry VIII holding one. Actually this would work well with good sized goose legs, that would be proper for medieval times. Bacon also goes great with Goose, though I would suggest maybe a Sage based rub and an apple brine. Love the step by step photos! It is clear you pour a ton of time and energy in your posts! Love it, so creative! I tried this without the bacon but followed the rest of the guide. I found the few redone I missed pulled right out after cooking, so don’t be alarmed if you don’t get them all. The only problem I had was not buying enough turkey legs!!! Could you kindly send me a photo of the page? I’m inspired to try vintage recipes. The Peking Duck is hung for 3 days so the idea has merit. I have watched you on TV grilling at competitions, your name alone made me laugh, but after watching you and now viewing your website, you my dear friend, are inspiring! Your recipes and photos are the best I have ever seen!!!! I want to be like you and enjoy life smoking and grilling. I tried your turkey lollipop recipe… OMG! Absolutely the best I’ve ever had! I can not wait to purchase products from you and try more recipes! can not thank you enough, you should be proud of yourself. Thank you for the time and energy you put into this website, I for one am a HUGE fan of yours! I’ve come back to this two years in a row. I brined my legs to give them a more ham texture and flavor but this has been killer. I did a bacon weave last year, I’m going to try this spiral wrap this year. That picture is fantastic. Also can we all appreciate the fact that this recipe didn’t have a 30 minute narrative about a recent trip to Disney World or an in depth explanation about a family food allergy, feelings about elections, etc? Food blog winning.